Don't get me wrong I would love to do more holiday themed crafts, I just seem to never have enough time! So, even though the 4th of July is only a couple of days away, it is not here yet! Muaha ha ha ha (maniacal laugh) I am not late! Ok, so yes. I wasn't actually planning to make this. It just happened today, and I really had fun doing it. Don't you just love spur of the moment projects? I do. Several weeks back, I grabbed this wood and just decided I had to do something with it. My friend had given it to me (knowing my obsession with scrap wood). I loved how the ends were just broken off and I started laying them out to see how I wanted to put them together. I decided to do one ragged end and one cut end. 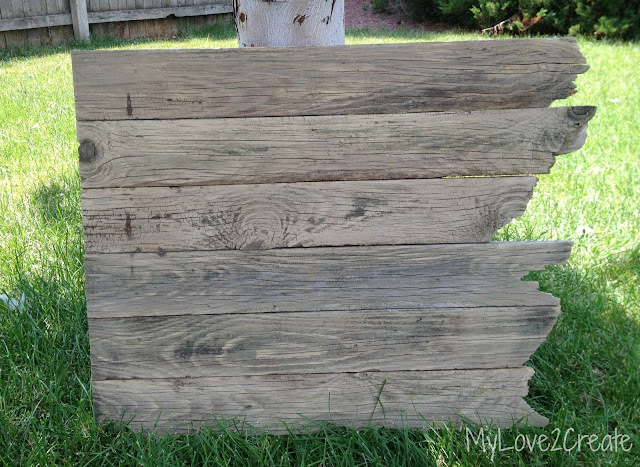 Then with more of the scrap wood I got I glued them on the back of the boards and nailed them down, making sure to nail into every board. I used my nail gun, it only took a couple of minutes. And this is how it has sat in my shed for weeks. Waiting for me to decide what quote or picture or something to put on it. I have been seeing lots and lots of cute flags around the past week in link parties and when I saw one this morning I knew I had to make one. And I already had the boards done! I taped off a corner for the stars. White washed it. 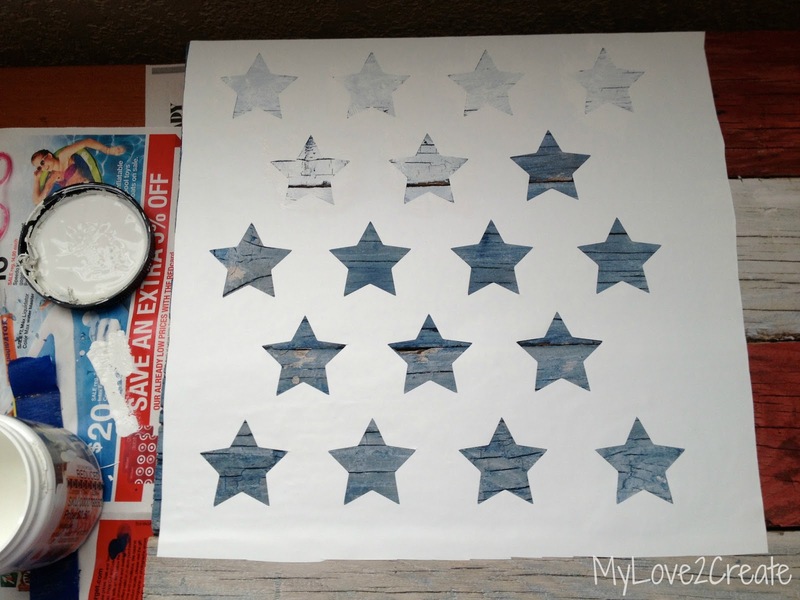 Then put on stars I cut out of contact paper on my cricut, and whitewashed the blue over top. Everything was great. Until I peeled off the stars. Then red. I went back and designed a star stencil, with different contact paper. I slapped it on and lightly painted my stars (no white washing this time, I think it was the watered down paint that made it seep the first time, lesson learned). To hang it I screwed in some eyes and attached some wire. 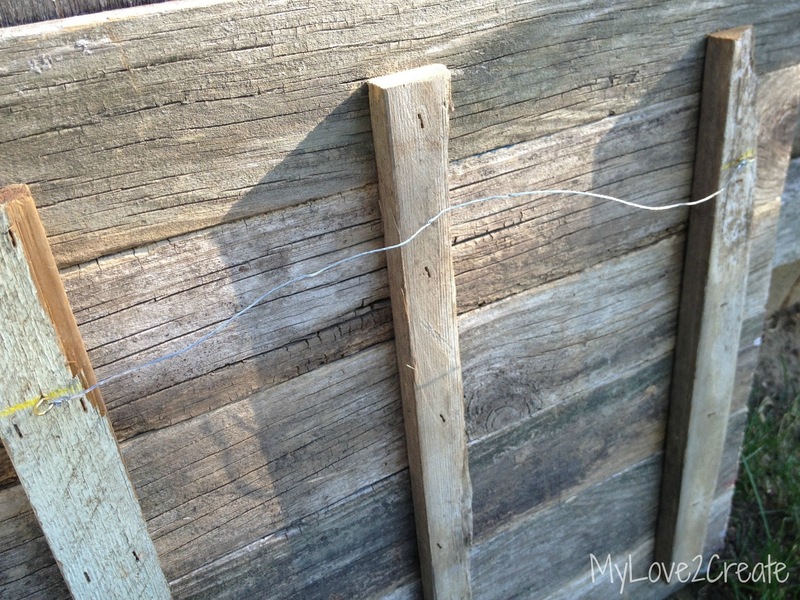 Then I hung it on my fence where I have a nail hammered in to take pictures. 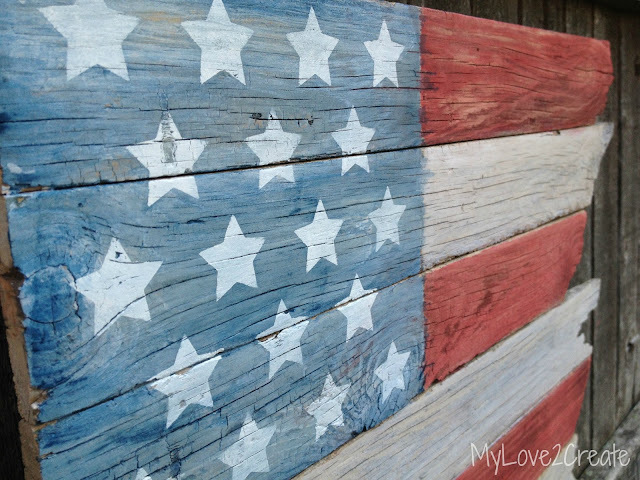 For now I am quite pleased with my flag, and it will do quite nicely for my one and only 4th of July decoration! 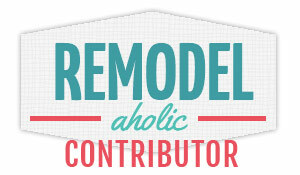 Are you a holiday decorator? If so, someday I want to grow up and be just like you! Thanks for stopping by! I am almost ready to share my husbands desk and hutch I just finished! I hope to see you soon! I absolutely love it! Pinning this! This is so great and I love the tutorial.Very cool! Thanks for sharing. I wanted to invite you to come over to my blog and join the challenge this week. The challenge is Red, White and Blue. Each week we have a new craft challenge. The link up begins tomorrow, Wednesday so come on over!!!! 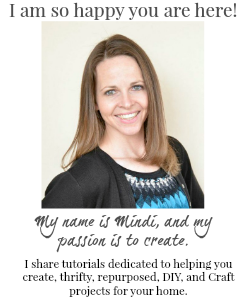 Mindi, I LOVE your flag and it turned out beautifully! Thanks for sharing - pinning! Have a fantastic holiday! AWESOME! You are so talented. Thank you for the tutorial and wishing you and yours a terrific Fourth weekend ahead. 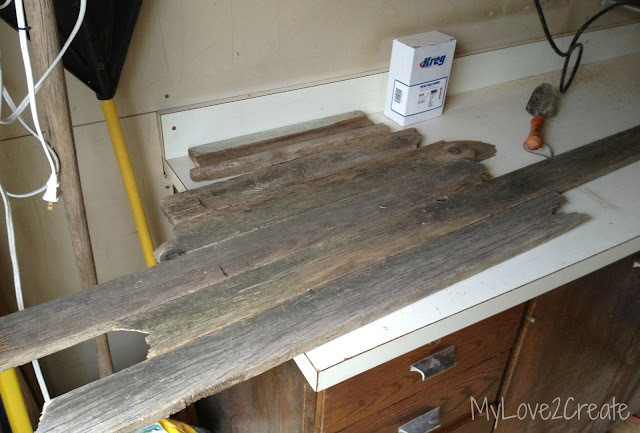 Love it, what a creative use of wood that someone else might have thrown away, awesome job!! So great! Has the feel of a tattered old glory blowing in the wind! Oh my gosh, I got so distracted, I forgot to leave a comment on your great project. I've done a couple of these kind of flags. I got some cool fence today that would be great for another flag. Boy did you show up!!! You so rocked it girl!!! 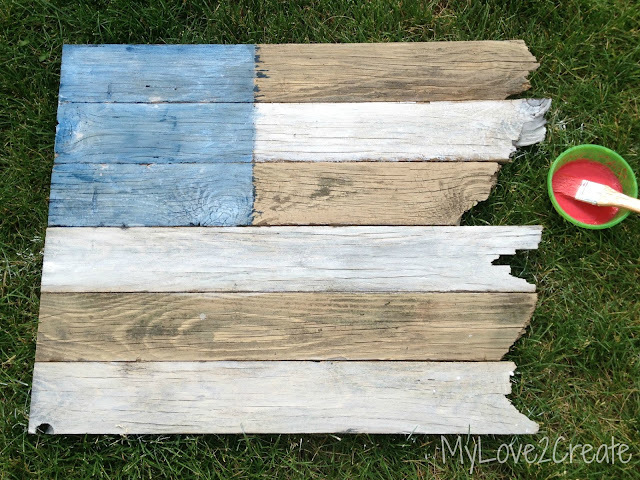 This flag is rustic and just plain perfect! 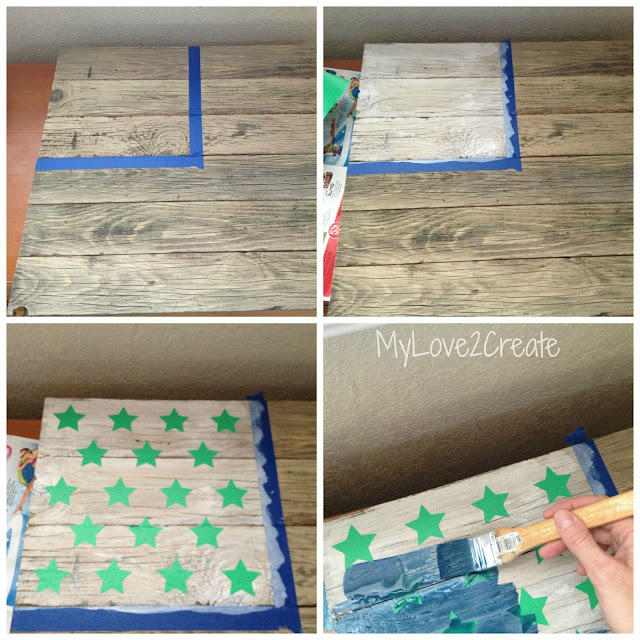 I am so behind...I was going to do a craft with the kids but well..ya know how time flies! I love this piece!!! Just so awesome!!! Happy 4th...I hope you and your crew have a wonderful day!!! 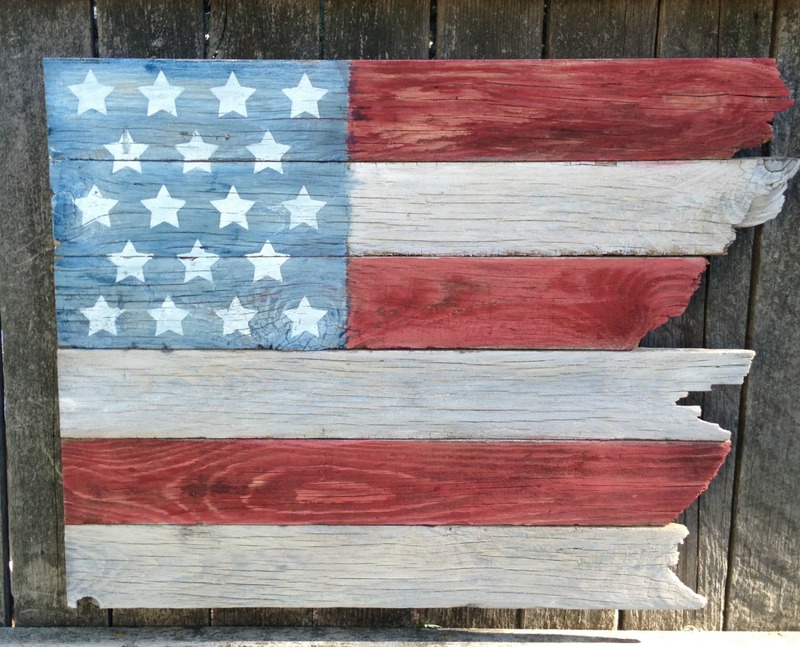 I have seen so many flags for 4th of July, but hands down, yours is my favorite because of the wood of all different sizes. I need to do something like this. 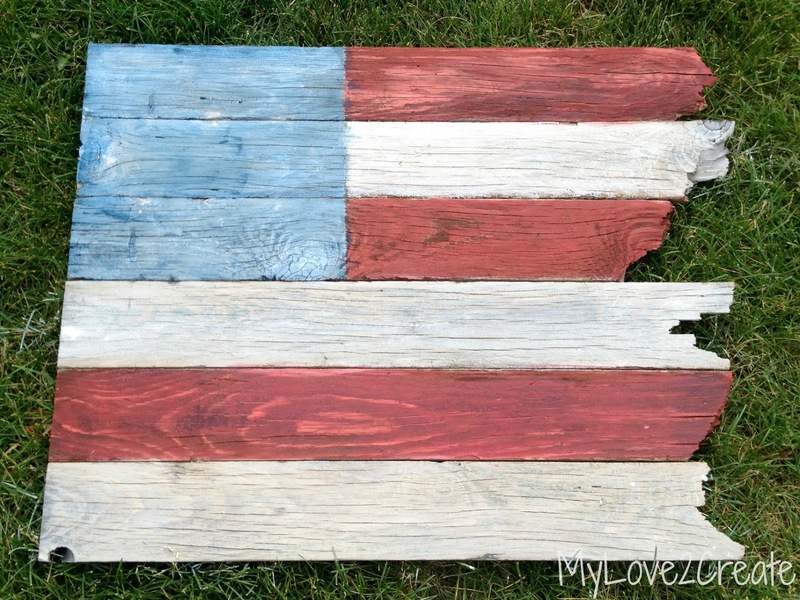 This is my favorite wooden flag I've seen in all the blog hops this year. Love the jagged edge. Great job. I love this! Something to do with all the cracked pallet wood I have laying around, the jagged ends give it great character.. Thanks for the inspiration! I love your wood flag! Such a cool project! Love what you did with that scrap wood! This is such a cool project!! I love it! I am always late to the holiday decorating too! Thanks for linking up with at the Ladies Only Blog Share! Following you now! 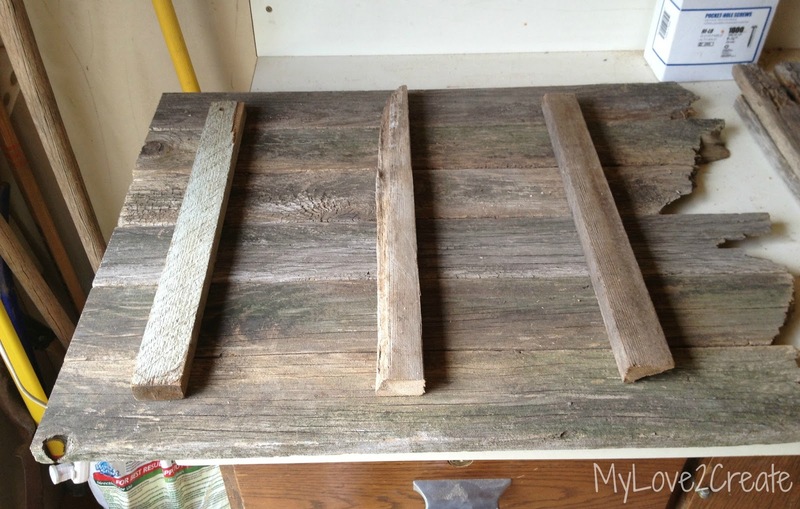 What a great project to recycle old pieces of wood. Thanks for sharing. Wow, this turned out great. Your tutorial is is excellent and your photography is beautiful! We would love to have you join us at our Saturday Show Us How You Rock Link Party starting July 13th. THis looks so awesome! I love it. My spur of the moment projects always tun out the best! I love this...pinning! You should join me in the Whimsy Wednesday link party starting every Tuesday night at 7:00. I confess, I rarely decorate for holidays (except for Christmas). I'm always too late too. I love your new flag though! Thank you for sharing it at What We Accomplished Wednesdays. Have a great weekend! This is very cool. Absolutely loving it. Fabulous! Love it so much. Great idea and inspiration. Thank you for sharing. I LOVE it, so ingenious! I absolutely love this project! Great Job! Thank you for linking up at Hickory Trail! Wonderful. So love it and will have to keep some old wood for this beauty. Thanks for sharing. Love this!! Got it pinned and saved on our HITS board! Hi Mindi, I thought for sure I left a comment, but even if I'm late, this is so fabulous!! I'll be featuring this in the Be Inspired Patriotic Party Showcase tonight, thanks for joining in!! 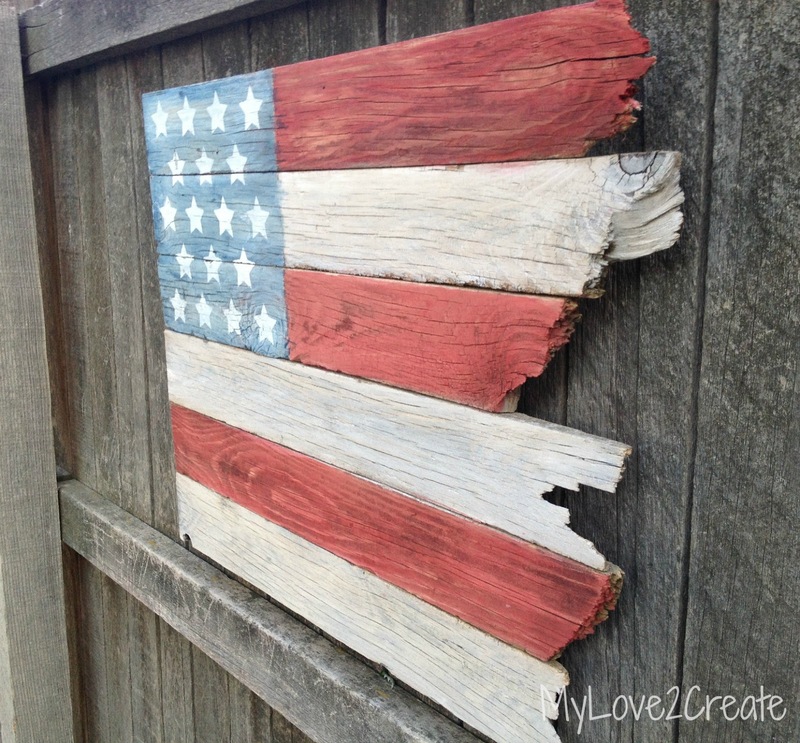 Seriously love the ragged raw edges of the flag! Of course I am super partial to anything flag related! So cool! Thank you for sharing at Give Me The Goods! 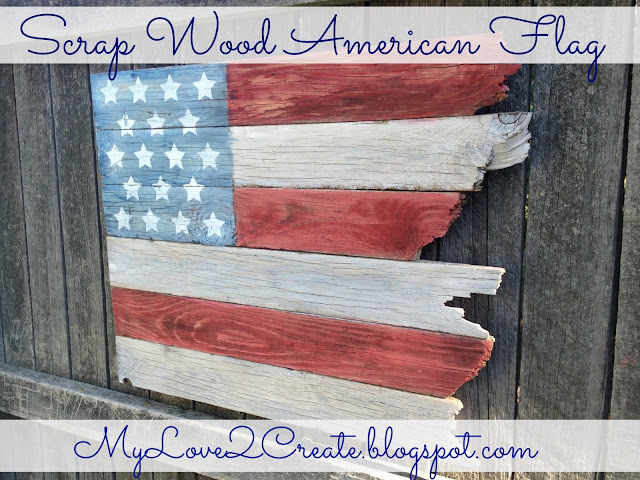 Love the "old and ragged" look of your flag...gonna be putting my husband to work on one , soon. Thank you for sharing....I pinned it for you! Wow it's really nice...Beautiful layout. Excellent work you did. I have you bookmarked to check out new stuff you post. Keep sharing more. This is so cute! Looks like an 'old glory'.